DNR Forestry keeps Minnesota's forests and trees growing strong. Minnesota's 59 state forests, school trust acres, and other forested lands make up the 4.2 million acres we manage. Our forests need care and management to provide clean water and natural resources for future generations. With this in mind, we weave sustainability into all of our forest work—from what trees to plant, to what areas to harvest, to what places to preserve. People cause 90 percent of wildfires in Minnesota. Find out what you can do to prevent them. 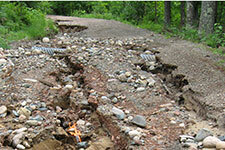 Rapid snow melt throughout the state means some forest roads and trails may close for safety reasons. Check the road closure list before heading out! Find your way in the woods. 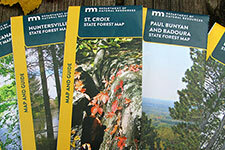 Several new state forest maps are available in paper or for download to your mobile device today. Check out the list of updated maps.